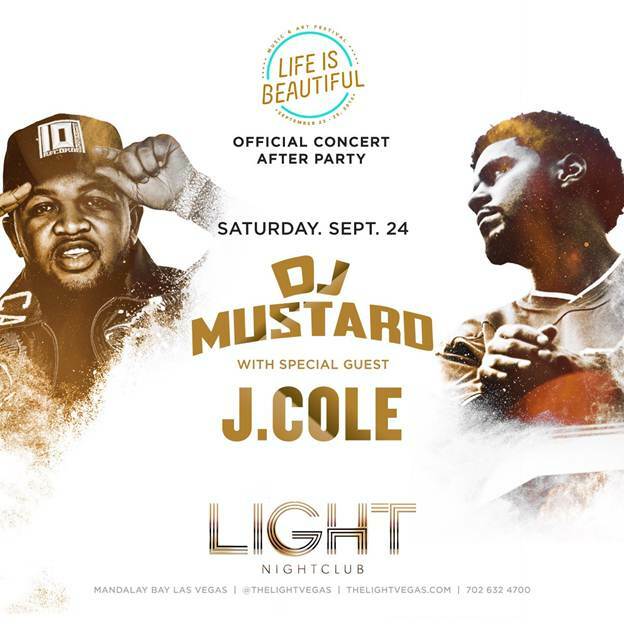 Life is Beautiful Music & Art Festival will celebrate their fourth annual event with an official after party hosted by Grammy Award-nominated hip hop recording artist and one of the festival’s headliners, J. Cole at the Light Nightclub in Las Vegas. The highly anticipated evening will begin at 10:30pm on Saturday, September 24th at LIGHT nightclub inside the Mandalay Bay (3950 S Las Vegas Blvd). Sounds will be provided by mega DJ and producer, DJ Mustard. LIGHT Nightclub inside the Mandalay Bay merges groundbreaking music with creative and cutting-edge visuals to produce a new and exciting nightlife experience. The chic, fashion-forward 38,000-square-foot venue features state-of-the-art production, visual effects and world-renowned DJs. Designed as an experience to play with your senses, LIGHT offers far more than the traditional nightclub. For tickets and table reservations, visit thelightvegas.com. Life is Beautiful Music & Art Festival is an annual celebration where people from all walks of life come together and create an experience centered in music, art, taste, and ideas. That gathering of people, by very nature, becomes a platform in which positivity prevails, culture and creativity thrive, and transformation occurs. Hundreds of celebrities, festival-goers, and guests will fill the venue to celebrate the one-of-a-kind 3-day festival that brings together the very best music, art, food, and learning programming into Downtown Las Vegas. Acts this year include Bassnectar, Mumford and Sons, J. Cole, Flume, The Shins, Major Lazer, G-Easy, and more. To purchase tickets to Life is Beautiful Music & Art Festival, visit Lifeisbeautiful.com.